I chose to read Ash by Malinda Lo for A More Diverse Universe this week in part because it also meets the criteria for the R.eaders I.mbibing P.eril Challenge. Killing two birds with one stone so to speak. From the moment I began reading Ash by Malinda Lo, I knew I would like it. I was immediately taken in by Lo's writing and swept into her world. 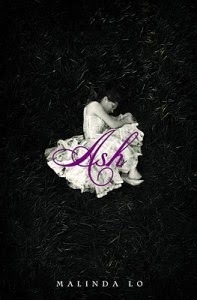 Ash is a retelling of the Cinderella tale, and much of it was familiar and yet quite a bit was different as well. One quality I enjoy about retellings is just how familiar they are. It can also be their downfall if the story is just a rehashing of the original, of course, but the ones that stand out are the stories that take on a life of their own. Malinda Lo's Ash does just that. Aisling, or Ash, is a sweet girl, lost in her grief. She first loses the mother she adores and then her father, being left in the care of a stepmother who obviously sees her more as a burden than anything else. While the youngest of the two stepsisters is mostly kind to Ash, the eldest is not. Locked in the cellar when she talks back to her stepmother and made into the family slave, Ash hates her life and longs to be with her mother. She turns to the fairies for help, remembering the stories she had heard as a young child and continued to read and dream about as a young adult. One fairy in particular takes a special interest in Ash, although she isn't sure why. Sidhean seems to be a sort of protector, and yet Ash knows that protection and guidance comes at a cost. With fairies, there is always a price to be paid. Sidhean is beautiful and yet dark; Ash is not quite sure she can trust him. Yet, she begs him to take her home with him, to save her from her miserable life. He refuses each time. At least at first. Then Ash meets the King's Huntress, Kaisa, and things change for Ash. A friendship evolves between the two young women, and Ash finds herself looking forward more and more to her visits with Kaisa. The more time they spend together, the more their feelings for one another grow. Sidhean waits patiently and when called upon to grant a wish, he binds Ash to him. Ash agrees in desperation, but worries the cost will be too high. Promised to Sidhean but longing to be with Kaisa, Ash is not sure what to do. Elements of magic and magical beings have faded in Ash's world, not fully believed in and yet there are those who still cling to the old ways. Fairies are just characters in stories, some argue, as a way to teach children how to behave. Ash's mother was of the old ways, however, and Ash believes. Her fairy Sidhean is proof of the fairies' existence. I loved how the author inserted the stories of magic and fairies into the novel by the characters telling the stories themselves. There is a subtleness in the author's writing that really drew me in. Admittedly, the characterization in the book wasn't its strongest suit, but I thoroughly enjoyed it anyway. I loved the world the author created around her characters. Lo's descriptions made me feel as if I was right there in the pages of the book. I came to really care about Ash and Kaisa, their love evolving from friendship so naturally. It was beautiful and sweet, without being overly so. It is a quiet novel. There is definitely darkness in this tale. No fairytale is without it. I was sad to see Ash come to an end. I was not ready to leave Aisling's world. To learn more about Malinda Lo and her books, please visit the author's website. I enjoyed reading Ash too. What most memorable to me is where the story is leading... And of course the characters Ash and Kaisa are equally unforgettable too. Melody - Yes! I I feel the same. And I don't think I will forget Kaisa and Ash anytime soon either. I don't generally enjoy fairy tale retellings but my sister loves them. I'll have to tell her about this book. Kathy - I hope she will like this one if she reads it, Kathy. I enjoy fairy tale retellings, even if I don't find all of them successful. Ash sounds good! Jenclair - I haven't read too many of them, but I enjoy them now and then. I really liked this one. Having been disappointed with this book myself thank you for sharing your thoughts and opening my eyes to a whole other way of looking at the story. Tracy - I'm sorry this one disappointed you, Tracy. Great review! I don't usually read fantasy, especially not fairy tales, but the original elements intrigue me. So nice to connect with another book lover! Sarah - Thank you! Fantasy is one of my favorite genres, but I tend to be picky about the fairy tale re-tellings I will read. I'm glad this one worked for me. Re-tellings are not for me but I know there are some good ones out there and they must be popular because there seems to be many! Ti - I don't read a lot of them, but when I do, I usually enjoy them. This sounds fabulous! I love a fairy tale retelling and it sounds like this one got just the right amount of twist. Looking forward to reading this one! Katherine - I thought so. It reads quickly and it is not action packed, but it's a sweet story with some darker elements. I haven't heard of this one but it sounds like a good one. I love rich characterization in a novel but I'm willing to forgive the lack of it if world-building and writing make up for it. 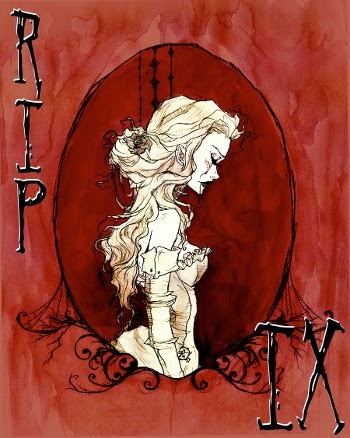 Trish - I read another review yesterday in which the book blogger wrote that she felt there was rich characterization--maybe for Ash's character, but I didn't see enough of it for the other characters, including Kaisa. I did enjoy the story though. I have only read a couple of fairytale retellings, but I am willing to take a chance on this one. Very good review. I will have to check to see if it is part of a series or not. Thanks. Rita - Thanks! As far as I know, Ash is a stand alone novel. Rita - I take that back. Evidently there is a prequel called Huntress, set in the same world, but both books are unrelated otherwise. So, they can be read as stand alone books. This sounds wonderful! I'm not as wary of retellings of fairy tales as I am of retellings of out-of-copyright classics (like Margot Livesey's retelling of Jane Eyre). Fairy tales have always "belonged" to all of us, and it's fascinating to see how modern authors re-imagine the story. 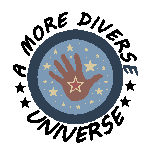 I'm really enjoying the More Diverse Universe posts I've been reading. It's a great challenge. A.M.B. - That makes sense. I don't often read re-tellings, but mostly it is of fairy tales. I did read a very loose re-telling of Jane Eyre once (I hadn't realized that was what it was at first), and ended up liking it, luckily--but it was also very different in enough ways that it didn't seem like the author was taking advantage of Charlotte Bronte's memory. At least in my mind. As much as I loved Ben Winter's The Last Policeman Trilogy, I doubt I will ever read his Sense and Sensibility and Sea Monsters. I actually have rather strong feelings about those types of books. Malinda Lo wrote a really wonderful article about reading diversely recently, I think Jenny linked to it, and that made me want to read all her books. So glad you enjoyed this one - I love fairy tale retellings, so definitely plan to check it out! Aarti - I haven't had a chance to read the article yet, but I saved the link so I could go and read it when I have time. Great pic for the challenges I've see Ash around before and it sounds like a good one. I've read a few re-tellings and I enjoy them when done well. I've been thinking about read this one for a while now - I think you've convinced me. Sounds like a thoughtful, compelling read. Elizabeth - I liked it. It is a quiet novel, but I really liked the author's writing style and her take on the story. I'm doing both of those challenges as well! But I didnt manage to do any two birds with one stones reads for either. Good on you. I've been hearing a lot of hype about this recently, it sounds awesome. Meghan - I am glad to hear you liked it too! Samantha - Thank you! I hope you like it when you read it!